Perception of body appearance and its relation to clothing; Subjective assessment of clothing appearance; Subjective assessment of clothing fit; Objective evaluation of clothing appearance; Objective evaluation of clothing fit; Fabric properties related to clothing appearance and fit; Garment drape; 3D body scanning; Human anthropometrics and sizing systems; Garment design for individual fit. Fashion and beauty have helped shape history and today more than ever, we find ourselves under increasing pressure to think about what we wear, what we look good in and how best to enhance our body shape and size. Behind this seemingly superficial industry, however, lies a technical thinking firmly grounded in science and technology. 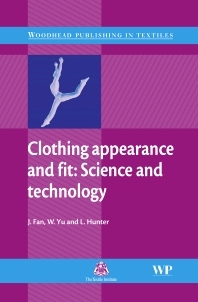 In one fully comprehensive book, Clothing appearance and fit: Science and technology provides a critical appreciation of the technological developments and scientific understanding of the appearance and fit of clothing. The authors bridge the science of beauty and fashion design with garment evaluation technology, garment drape and human anthropometrics and sizing. The ten chapters of the book provide a detailed coverage of clothing appearance and fit. Chapter 1 considers body attractiveness and how it relates to clothing material and design parameters and discusses classical and contemporary theories of beauty. Chapters 2 and 3 present the industry’s techniques, methods and standards for assessing clothing appearance and fit and Chapters 4 and 5 review the research and development of objective measurement technologies for evaluating clothing appearance and fit. Fabric objective measurement, fabric properties and garment drape are covered in Chapters 6 and 7 and the R & D of body measurement, anthropometrics and sizing systems are detailed in Chapters 8 and 9. The final chapter reviews published work on garment design and pattern alteration for achieving good clothing appearance and fit. This book is an essential reference for researchers, academics, professionals and students in clothing and textile academia and industry. It includes many industrial standards, techniques and practices. Professor Jintu Fan was awarded a PhD from the University of Leeds in 1989 and is now Professor at the prestigious Institute of Textiles and Clothing at the Hong Kong Polytechnic University. He has many publications in the area of clothing science and technology. He has also received the Distinguished Achievement Award of the US Fiber Society. Dr Winnie Yu is a Associate Professor at the prestigious Institute of Textiles and Clothing at Hong Kong Polytechnic University. Professor Lawrance Hunter, Divisional Fellow (Manufacturing and Materials Technology) CSIR and Head of the post-graduate Department of Textile Science of the University of Port Elizabeth, South Africa, has been involved in textile R&D for almost 40 years and has published many papers at conferences and in journals. He was awarded the Textile Institute Warner Memorial Medal for his outstanding contribution to textile science and technology.